The Romantic Mansion Toronto is a historic Victorian home that was built in 1888 and was originally owned by one of the first female doctors in Canada. 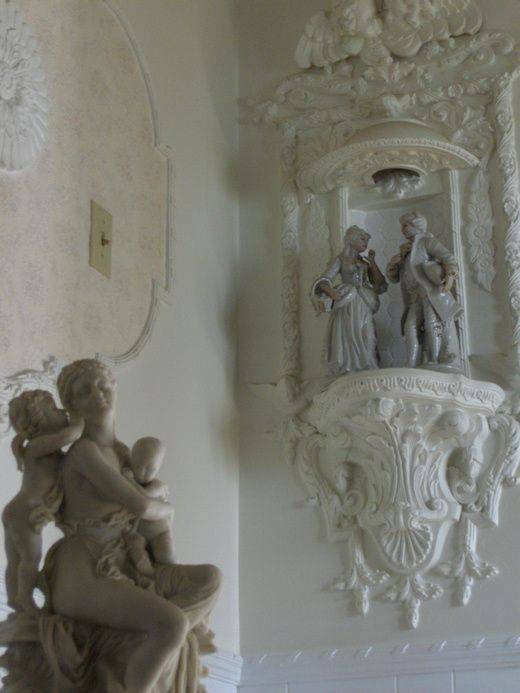 The unique Mansion has oversize Grand Rooms that showcase the remarkably beautiful custom plaster mouldings on the ceilings and walls. Guests have commented that there is no other B & B like it and have compared the luxurious museum like mansion to Castles in Europe. We are a luxury non smoking adult only (no children under 12) property. Smokers are invited to use our covered front entrance, garden or suites that have walkout terraces for their pleasure. 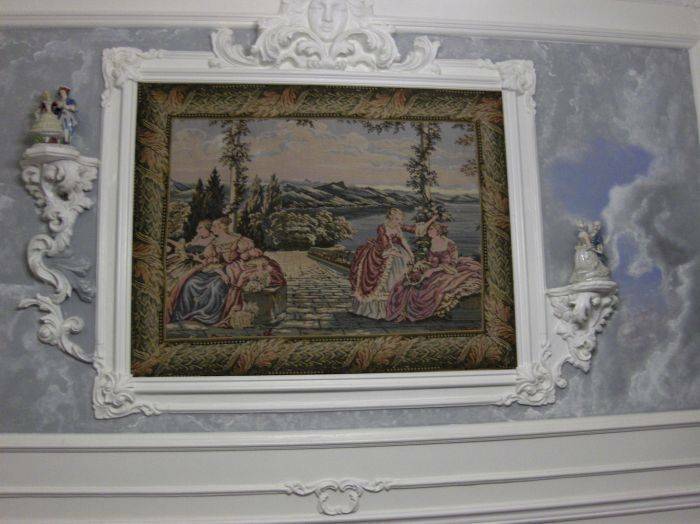 The elegant rooms have a Victorian and Rococo theme throughout and are all richly decorated with antiques, porcelain and colourful paintings. Well preserved are the many architectural detailings and original wood staircase, trim and mouldings. The ornate decor throughout consists of masterful oil paintings, porcelain, antiques, richly coloured rooms and tapestries, sparkling crystal chandeliers in many large spacious rooms. 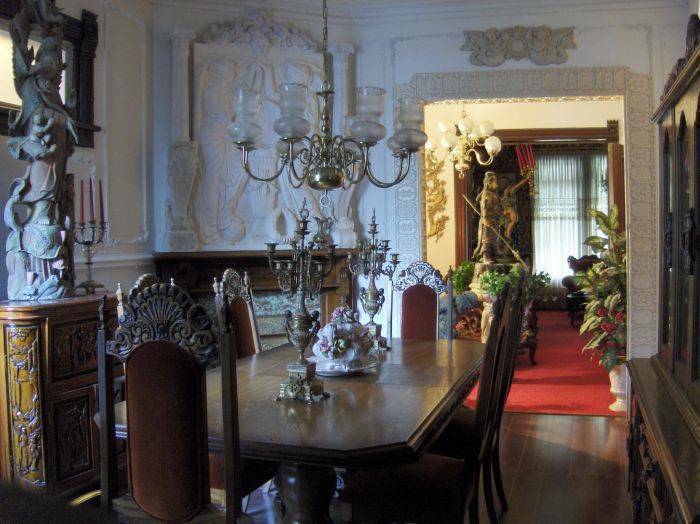 We are a very unique luxury 6, 000 square foot Victorian/Rococo B & B with excessively large rooms, custom architectural detailing and elegant Castle like interiors and decor. Please see our room combinations which include a daily buffet breakfast. Also provided for your benefit is a discreet inhouse security system. The section of Toronto that we are located in has many historic Victorian homes in the area and we are very close to all transportation connections which can be walked on foot for streetcar, bus, and subway and the City Centre is only 10-15 minutes away. Toronto Pearson International Airport is a mere 20 minute drive or you can also take an express bus transfer to Union Station in the City Centre. From Union Station we are a short 10 minute taxi ride to Victorian Mansion Toronto. Car Rental and taxi connection services are convenient from the airport. We are located near the Queen Street fashion district, entertainment district and restaurants, Art Gallery of Ontario, Toronto International Exhibition and Harbourfront, CN Tower, Rogers and Air Canada Centres, Toronto Eaton Centre, Yorkville and are a nice leisurely walk to High Park. We appreciate art, culture, music, romance, travel and the many good things that life has to offer. Your stay with us will include a rich continental buffet breakfast, daily maid service and some rewarding memories to take back with you of your time spent in beautiful Toronto. The luxurious mansion is approximately 6, 000 square feet with adjacent gardens and is located right in the heart of downtown Toronto. 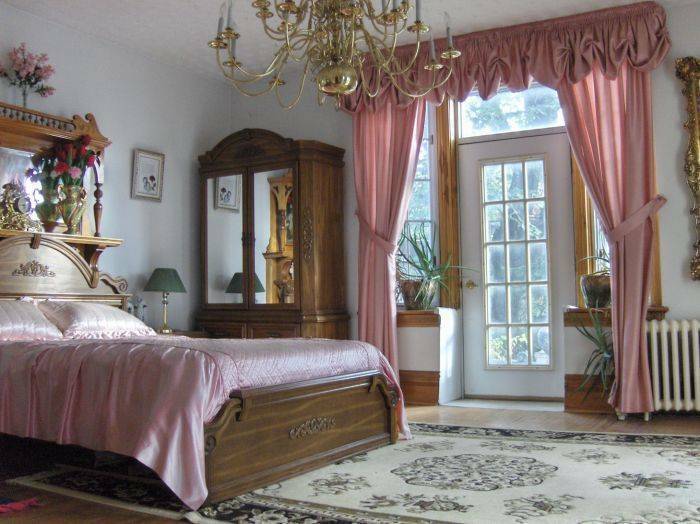 The Victorian Romantic Mansion Toronto is located in the heart of old Toronto and is within walking distance to all the best that Toronto has to offer to its guests. Toronto has a wonderful mix of old and new architecture and there are many recreational parks and marinas that run along the waterfront of beautiful Lake Ontario. Island fairies make daily scenic trips to the Toronto Islands. There are unique and special areas in Toronto such as Greektown, Little Italy, Chinatown and Cabbage town that are created as mini villages within the city. The shopping and wonderful mosaic culture of different nationalities and products are as unique and memorable as the different village areas in Toronto. Theatre productions, fine dining and night clubs are abundant throughout the downtown Toronto area. We are very near to Casa Loma, CN Tower, Ontario Place, Harbour front, Toronto Beaches, High Park, Yorkville high end luxury designer shops and restaurants, shopping district, theatre district (Roy Thomson Hall, Royal Alexandra, Princess of Wales Theatre, St. Lawrence Centre for the Performing Arts, Sony Centre Theatre, Canon Theatre, Rogers Centre, Air Canada Centre, Elgin Theatre, Winter Garden Theatre), restaurant district, nightclub district, Chinatown, Little Italy, Toronto Eaton Centre, Bata Shoe Museum, Toronto Art Gallery of Ontario, Royal Ontario Museum, Ontario Science Centre, Toronto International Exhibition, Toronto Zoo, Union Train Station, Toronto airport and transfer connections etc. We are pleased to offer 8 luxury double occupancy suites all with large North American Queensize beds that will include a hearty continental buffet breakfast, daily maid service. On the main level you can enjoy the common areas which include an oversize flat screen television in the ornate main floor lounge, the main dining room for breakfast and the reception area. You can walk out and see the gardens or explore the City of Toronto and all it has to offer at your leisure. Important: You must advise us of your approximate arrival time as we do not have a 24 hour reception desk and we must make arrangements to provide you with the room keys! PLEASE VISIT OUR OTHER ACCOMMODATION PROPERTY - A CASTLE IN CZECH REPUBLIC EUROPE! - CASTLE ROMANTIC CHATEAU KRASNA LIPA LOCATED IN KRASNA LIPA CZECH REPUBLIC IS ALSO ON THIS WEBSITE! We are pleased to announce that our premises have an inhouse camera surveillance system in all internal common areas, exterior front and rear entrance doors and our gardens. A daily buffet breakfast is included with all room combinations and all guests have access to the lounging areas on the 1st Floor including an additional large flat screen television for your viewing pleasure. You are also welcome to tour our grand gardens for your enjoyment. Guest inquiries please contact us and clearly indicate which suite or apartment combination you prefer indicating the total number of people in your party for your luxury accommodation reservation. Thank you for selecting Romantic Mansion Toronto as your preferred luxury accommodation provider. Pricing ranges from $80 - $250 Canadian per room per night – Pricing subject to change during the months from May - September. Full Payment is due in Cash only upon your Check In date. Please inquire about our discounted room rates per night and special promotions which are available on all room combinations when offered. Price includes access to 4 luxury guest rooms (double occupancy), Walkout terrace, 1 Kitchenette, 2 Televisions, 2 Washrooms, Jacuzzi Whirlpool - sleeps 8 persons. 2 single beds at no additional charge can be added to each of the 2 largest luxury suites on the 2nd and 3rd floors to sleep a maximum of 10 persons. Also includes access to all rooms on the 1st floor main level: Living Room, Dining Room, Main Kitchen, Sunroom and Tapestry Lounge Rooms, Main Washroom with bath and shower, access to Mansion Gardens, WIFI connections throughout the Mansion, Secure Private Parking for 2 cars, daily breakfast, daily maid service. An additional main floor large flat screen television is also provided for your viewing pleasure. Price includes access to 8 luxury guest rooms (double occupancy), Walkout terraces, 2 Kitchenettes, 4 Televisions, 4 Washrooms on the 2nd and 3rd floors, Jacuzzi Whirlpool - sleeps 16 persons. 4 single beds at no additional charge can be added to each of the 4 largest luxury suites on the 2nd and 3rd floors to sleep a maximum of 20 persons. Romantic Mansion Toronto is the perfect location and Castle like setting for special celebrations such as anniversaries, birthdays, small weddings and conferences. You will be pampered like royalty in our luxurious oversize rooms with grand decor. Pricing will be submitted upon your request. We can accommodate businessmen from out of town who want to stay in a luxury accommodation setting for an extended period of time. Our rates are negotiable regarding this offer. Large luxury guest bedrooms with historic high ceilings, architectural detailing and antiques. Some suites are equipped with a kitchen, extra guest room or walkout balcony terrace. The oversize Luxury Garden Side Suite includes a very large living/sitting area which is part of the main suite. The private adjacent luxury washroom is a separate room and has a sunken tub for 2 whirlpool tub. Payment of your reservation - can be made by cash on your Check In date, , or by bank transfer 14-30 days before you check in date to our bank account in Canada. - Group discounts are available for booking 2 or more suites at the same time and are for a minimum of 4 or more nights and for repeat customers who book with us each year. Thank you for your business and we hope you enjoy your stay with us! Take HWY 427 South to the Gardiner Expressway. Take the Gardiner Expressway East to Toronto. Take the Jameson Street exit and then drive north to Queen Street. Turn right onto Queen Street to Dovercourt Road. Turn left on Dovercourt Road. Proceed up Dovercourt and we are the large Grand Mansion located on the left hand side of Dovercourt (224) and Mackenzie Road. Airport Express Bus is $14. 95 one way, or $25. 75 round trip Canadian when purchased at the same time. After arriving in downtown Toronto, you should get off at the Royal York Hotel, and from there a cab ride will cost approx. $10-15. A taxi from the airport directly to the Mansion will cost you approximately $40. 00. Public Transit- Look for the directions to the TTC (Toronto Transit Commission) and take the 192 Red Rocket to Kipling Subway. Take the east bound train to the Yonge/Bloor station and transfer to the Yonge line, southbound. Get off at the Dundas station. Take a Dundas west streetcar to Dovercourt Road (approx 10 minute ride). We are a 5 minute walk down Dovercourt Road and are located on the right side of 224 Dovercourt at MacKenzie Road. 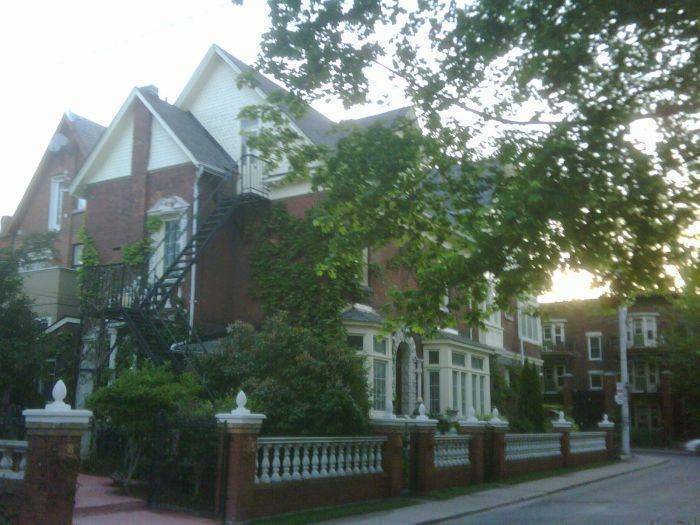 We are the Grand Mansion located directly on the corner of Dovercourt/MacKenzie roads, you can’t miss us. Cost for the TTC is $3. 00 exact change per person. Taxi or Limousine Service from Airport - When you walk outside of the baggage claim area, immediately in front of you will be a line of taxis, and next to them a line of limousines (usually Town Cars). Both cost approx $45 Canadian. The Limousine service charges a fixed flat fee where a taxi will keep the meter running in traffic resulting in a much higher fare charge. Follow the QEW into Toronto and take the Jameson Street exit and then drive north to Queen Street. Turn right onto Queen Street to Dovercourt Road. Turn left on Dovercourt Road. Proceed up Dovercourt and we are the large Grand Mansion located on the left hand side of Dovercourt (224) and Mackenzie Road. Take the Don Valley Parkway South exit to Toronto. Take the Spadina/Lakeshore Blvd Street exit to Lakshore Blvd West. Turn right on Bathurst St. Turn left on Dundas St. West. Turn left onto Dovercourt Road. On the right side of Dovercourt/Mackenzie Road is Mansion at 224. Take the 401 East to Don Valley Parkway South. Take Dundas West and turn left onto Dovercourt Road. On the right side of Dovercourt/MacKenzie Road is Mansion at 224. 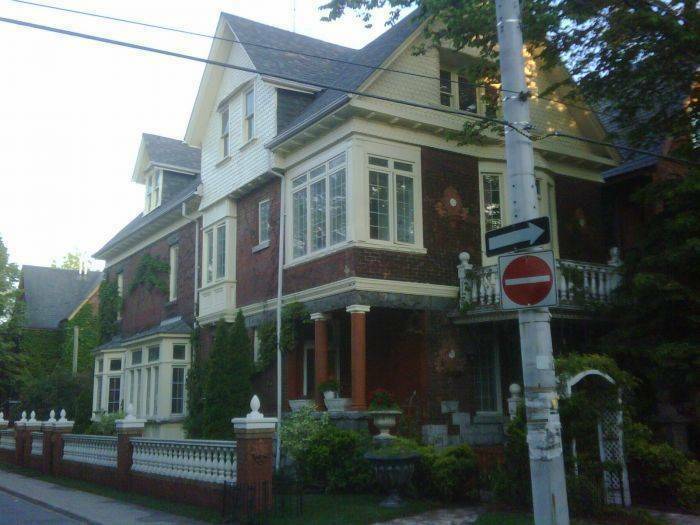 Subway, and bus are within a 5 minute walk from the Romantic Mansion Toronto. Union Station railway station is only 10 minutes by cab or 20 minutes by streetcar.